The telecommunications subsystem is used for receiving and transmitting commands and data. It is a two-way radio system, somewhat similar to a pair of very sophisticated walkie-talkies. The telecom subsystem on Mars Reconnaissance Orbiter is like one walkie-talkie and the Deep Space Network antenna back on Earth is like the second. With its large-dish antenna, powerful amplifier, and fast computer, Mars Reconnaissance Orbiter can transmit data to Earth at rates as high as 6 megabits per second, a rate 10 times higher than previous Mars orbiters. This rate is quite high considering that Mars Reconnaissance Orbiter achieves it while 100 million kilometers (62 million miles) from Earth. The spacecraft has already provided more than 50 Terabits -- that's 50 million million bits. To put it another way, that's more than all the data transmitted by all previous JPL spacecraft put together! 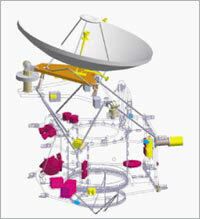 The orbiter's radio operates in the X-band of the radio spectrum, at a frequency of around 8 gigahertz. That means that the electromagnetic carrier wave -- onto which the data is modulated -- oscillates at 8 thousand million cycles per second. For comparison, your radio at home is designed to receive signals from AM stations in the range of 535 - 1,700 kilohertz, and from FM stations in the range of 88 - 108 megahertz. Now, here's a question: If you could make an electromagnetic wave that oscillates at 500 Terahertz -- that's 500 million million cycles per second -- what would you have? Answer: Visible light! And you produce these amazing waves every time you flip on a light switch! Also on board is Electra, a UHF telecommunications package that is one of the engineering instruments providing navigation and communications support to landers and rovers on the surface of Mars. Electra allows the spacecraft to act as a relay between the Earth and landed crafts on Mars, which may not have sufficient radio power to communicate directly with Earth.